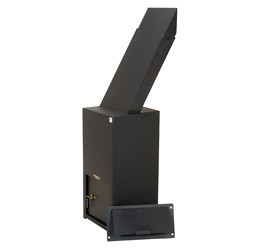 * This Classic Style Perma-Vault Top Loading Drop Box is made in the USA. 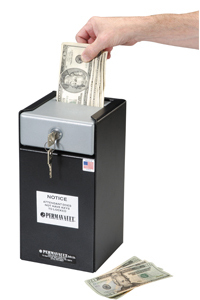 This Compact, Through the Wall Depository Safe is made in the USA. 1/2” x 10” at opening; 2-1/2″ chute capacity. This Large, Through the Wall Depository Safe is made in the USA. Chute is designed as part of the safe and cannot be removed; measures 5-1/2” x 10” at opening; 2-1/2″ chute capacity.